Sheesh, a hard one. 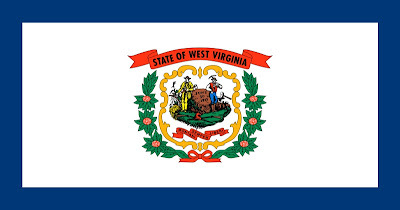 Both have a good graphic element (I like WV's border, and underused element) with a overdone seal. Del's is less so. Simplier seal, would be easier to abstract. 4: District of Columbia -- double points! Finally a strong graphic design! Plus I live next door. Usual reasons, plus some sentiment (once lived there). 1. NH. I usually pick land over sea since I get seasick, but the NH seal has so many purty elements. 2. DE. Odd color and the diamond thing makes it distinctive. Plus they have nicer beaches than WV. 3. NY. What's with that disembodied sword on the MA flag? Gives me the creeps. 4. DC. No contest. Apparently cannot become a state because their flag is too cool. 5. ME. Again - dead bodies on flags don't impress me much, VA.
6. PA. At least you can see the contents of the crest. 1. Vermont. Anything with a tree wins. Plus it's home. Vermont - but mainly because I live there, but I tend to like natural iconography anyway. Both really ugly, but I guess I have to go with Delaware because I can't even tell what's going on in the West Virginia Flag. CD of course - I'm not sure it's the most exciting flag, but it certainly beats obscure heraldry on mustard yellow. 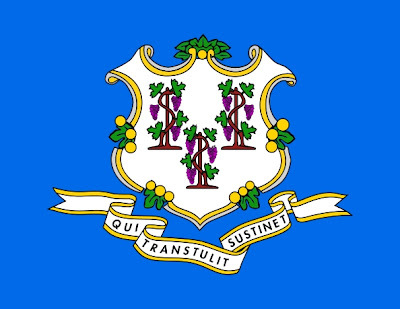 Connecticut - because the Pennsylvania one looks like every other seal. 1. Vermont. There's a cow! Need I say more? At least, I assume it's a cow. I don't see an udder or anything. Also, I like the way it looks like they wouldn't laugh at my graphic skills if I tried to reproduce it. 2. Delaware. There's a wolf! Dog! Cow! I dunno what it is, but I'm giving it the nod. I guess I'm charmed by ambiguous mammals. 3. New York. I want to like Massachusetts, but it simply isn't busy enough. New York--it's got everything! I mean, the sun has a smily face! There's Justice, with her friend who has a hobbit hat on a stick and is playing a game of kick-the-crown! 4. New Jersey. I like the suit of armor that was way archaic by 1776--and another lady with a hat on a stick! Geez, now I feel ignorant. What does the hat on a stick represent? Plus, if I'm not mistaken, the seal represents the noble pastime of plow racing. 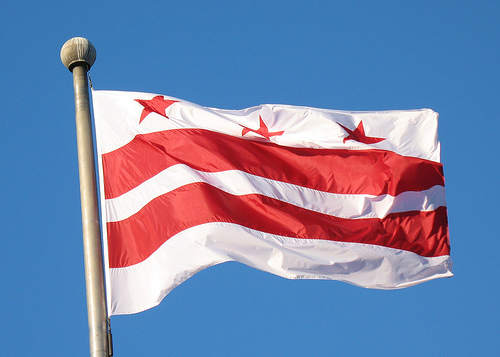 The D.C. flag clearly thinks it represents a sovereign nation. 5. Props to Virginia for putting a dead body on a flag and having the biggest phallic symbol this side of Priapus. However, I can't vote against the moose, who is probably really the one who took out the Virginia guy if what I hear about the deadliness of the moose is true. 6. While I think that the PA flag is a bit of an eyesore--despite the spectacular photography--I'm going to have to vote for it because of the sailing ship. There ain't no coastline in PA, yo. 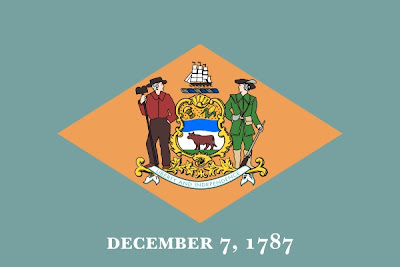 It's clearly confused about being called a "mid-Atlantic" state when it's not on the Atlantic, and that's the kind of state flag I vote for! Against a different state, CT might have won, though. Pennsylvania - horses! local bias! Connecticut trees look like dollar signs which is appropriate if you've ever been there. I'm surprised they don't have a cell phone on their flag. 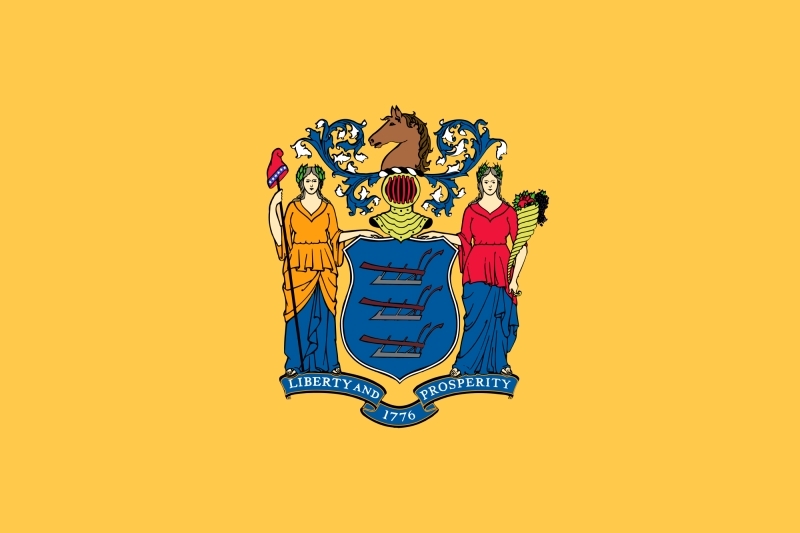 I also always liked that New Jersey's flag has almost the same unique color as their license plates. I don't know why the lady on the right has a toque though. New Hampshire beats Vermont, hands down. These are almost a tie for unattractiveness, but Delaware manages a slim victory. New York is victorious over the weird Massachusetts. The simplicity of District of Columbia is far superior to whatever it is that New Jersey has going on. Virginia and Maine are both awful. Maine manages to come out on top, since it doesn't feature a dead body. Connecticut and Pennsylvania are so bad I deem them both disqualified for steroid use. 1. New Hampshire. I'm all about the symmetry, plus what's up with the stag head? 2. 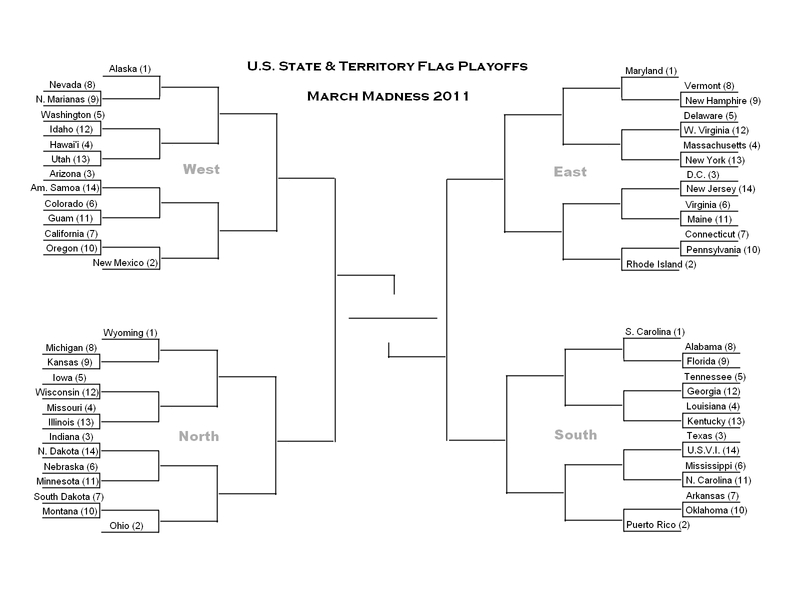 I don't like either of them, but I'll go with West Virginia as it would be easier to visually ignore. 3. A banner with a strange device! I have to vote for New York. 4. New Jersey consistently gets a bad rap for everything, but in this case it's justified. My vote goes for the non-state of DC. 5. The guys in Maine are much more relaxed and pleasant to look at, plus there's a moose. Maine. 6. What is that waiting on the shore of Pennsylvania - three elephants? I vote for the viniferous Connecticut, AND give it my super-extra-special vote because of the motto: "Editors rule the world!" Or that's how I'm translating it anyway. Both are bad 'seal on a blue bedsheet' type flags, both are intricate, contain writing, and both have absurdly complicated elements. That said, I pick Vermont, because the background is less complicated by far than New Hampshire's. Also, New Hampshire's contains two wreaths and a ship with rigging, plus a miniature American flag. Vermont's tree and cow look a little more reproduceable. Both of these are marginally better than usual background with seal state flags, with Delaware boasting unique (but tacky) colors, and West Virginia a border and nice contrast. Besides that, they both contain writing, as well as little dudes with costumes and weapons/farm implements. Delaware wins, because I can at least see all the action without magnification. Once again, another seal vs. seal match-up, with both flags containing one or more little people, and writing. Massachusetts wins thanks to its simple color palette, blue, gold and white, the fact that it would be much easier to draw, and because If I saw all 50 state flags flying I could pick out Massachusetts much more easily than New York's. 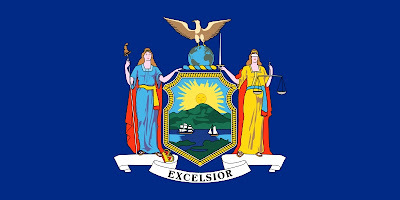 How many colors does NY's flag have, I wonder? I lost count at about a dozen. Washington D.C. A simple, two-color flag with lots of meaning (its the coat of arms of George Washington) and a distinctive look. A perfect, A+ flag. New Jersey is a D- with a complicated coat of arms over a nasty mustard yellow called buff. Apparently it was the color of the uniforms of New Jersey soldiers during the War for Independence. Whatever. 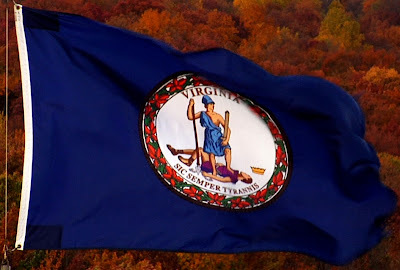 Both contain the state name and the state motto, but Virginia wins, because Liberty standing on the throat of tyranny like a boss (hence the motto, Sic Semper tyrannis) is pretty badass. Also, Virginia's flag is the only flag of any state in the Union to get a PG rating. Though I always did like Maine's star. Two more typical US state flags flags, blah blah blah. Connecticut wins because the seal is simpler and larger, and because the writing is at least readable. Come on PA, black on red writing? Really? If I can barely read what it says in a still, close-up picture, how the h*** can I read it when it's flapping in the wind, let alone at rest? At least Connecticut's flag is bold, and at least it chose its own shade of blue over the usual seal-flag-background-blue. Can't modify the previous post, so here's three things I want to mention as an addendum to it. First, at the top Michael5000 said "In the first round only, you may select one of your six preferred flags as especially favored; for that flag only, your vote counts double." I choose DC's flag as my especial favorite. Second, the cap on a stick in New York's and New Jersey's flag is called a Phryian cap. It is an ancient Greek symbol representing freedom, not a hobbit cap for Chrissakes. Third, why New Jersey over DC, Jeniffer and Dug? New Joisey has a horrible flag that breaks all the rules of flag design. The North American Vexillogical Association has a great little guide: (http://www.nava.org/Flag%20Design/GFBF/gfbf-1.htm) wherein are detailed the five cardinal rules of flag design. #1. Keep It Simple. The flag should be so simple that a child can draw it from memory. #2. Use Meaningful Symbolism. The flag’s images, colors, or patterns should relate to what it symbolizes. #3. Use 2–3 Basic Colors. Limit the number of colors on the flag to three, which contrast well and come from the standard color set. #4. No Lettering or Seals. Never use writing of any kind or an organization’s seal. #5. Be Distinctive or Be Related. Avoid duplicating other flags, but use similarities to show connections. New Jersey's flag meets none of those criteria, DC's meets all five. 1. New Hampshire over Vermont. Most of the state flags seem to have the state seal on them, and these are no exception. 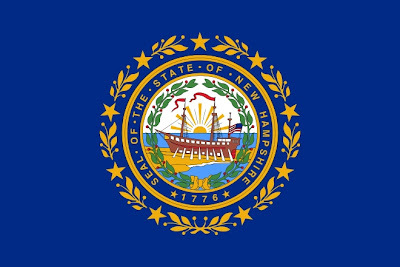 Although I like the subject depicted in the Vermont seal better (although I'm not sure why would they be rowing the ship up on land in the New Hampshire seal--I'm sure it has some symbolic meaning), New Hampshire's seal's scale seems to fit the flag better. Also, I think the sun is cool. 2. West Virginia over Delaware. I really don't like either of these very much--the detail is so small I can't even see everything each one's seal is trying to depict. Delaware is losing this one based solely on its color. Oh, and I know they must be proud to be first and all, but having the date on the flag like that seems really weird to me. 3. Massachusetts over New York. This one was close, but I opted for the slightly simpler Massachusetts design. The disembodied arm is weird, though. Looks kind of like a swimmer with a sword. 4. D.C. over New Jersey. Yay! No seal! 5. Maine over Virginia. Maine's subject matter is less violent (although, I, too, am anti-tyrant). Once again, I'm not overly fond of either of these. 6. Connecticut over Pennsylvania. As much as I like horses (and eagles and ships), Pennsylvania's flag is too busy for me. I like the simple, stylized vinyard scene depicted here, although the color of blue might get lost in the sky on a clear day. I don't like any of these well enough to select one as a preferred flag. I'll save that honor for a winner that wasn't picked because it was the least ugly. Vermont - They're both pretty scary. New Hampshire ought to lose because it is more fiddly, shows poorer art skills and is topped by a decapitated deer, yet I can't resist voting for that cute little cow. Delaware - Oh wow, have you deliberately put the worst flags in the first round here, or is this how it's going to be? I can't even tell all what's going on in the pictures, but clearly guns, ships, animals and axes are a really important part of statehood. Can we replace both flags with the version without the pictures? Fascinating as the details are with the guns on the ground wearing a hat, and stupid as the date looks on a flag, I'm going to give it to the one with the wolf. Or maybe it's another cow. Massachusetts - Who comes up with this stuff? We have an Indian with a bow and a star, topped by a severed arm, and he's up against Justice and her girlfriend (Vengeance?) with a landscape. I'm going to with the chicks, because the severed arm is bothering me. District of Columbia - Yikes, a real flag instead of a cloth replica of an elaborate free association doodle. At least this one gives the girls nametags. Why does Liberty have a toque on a stick? 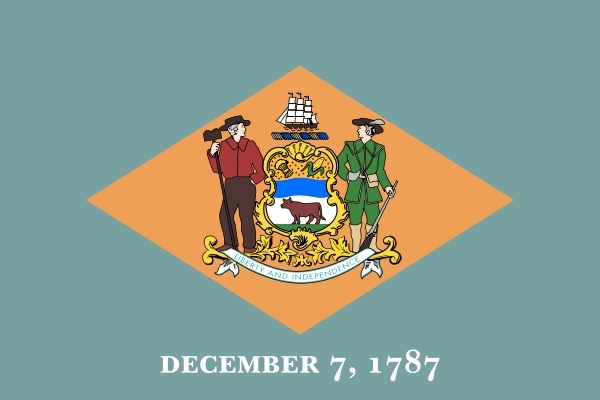 Was DC out sick the day all the other states agreed to have little pictures on their flags? Maine - After seeing Virgina while scrolling down I couldn't imagine how it could win. Did they forget that togas went out of style a couple of millennia before George III did? And what are those? Poinsettias? I have to give it to two dudes and a moose. Pennsylvania - I'm a sucker for rampant ungulates, and grapes don't do it for me. Grapes and what are those? Oranges? Connecticut is further south than I thought. So one eagle, two horses, three sheaves of wheat, a plough and a sailing ship plus an illegible motto and some gold scrollwork takes the prize. I don't have an especially favoured one, because while DC actually looks like a flag, it seems to be in the wrong weight class, and the kitch is starting to grow on me. Also, Jennifer: I think you and I would get along well. Aviatrix, reading your comments, I was thinking the same thing! 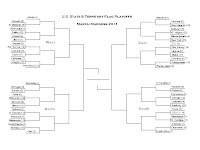 In this bracket, I like New Jersey because the horse's head reminds me of "The Godfather." and I'll especially favor D.C., for being the only flaggy flag in the bunch. 1 - Vermont, deer head FTW! 2 - Deleware, 80s color scheme FTW! 3 - Massachusetts, disembodied armed arm FTW! 4 - New Jersey - horse-head mafia reference FTW! 5 - Virginia, stomping on your enemies FTW! 6. Oh man... tough call. Pennsylvania cause it has horses. Someone with time and graphic art skills (doesn't have to be any better than Vermont) should compile a flag with all the things we collectively like, and one that embodies everything we hate. The "like" flag would have horses and pelicans, but not too many colours. The dislike flag would have the confederate cross, dead people, bad fonts and .. well you get the idea. Vermont over New Hampshire - I sort of like the stag on top, and I'm not a fan of the "Seal of ..." on flags. West Virginia over Delaware - I'm a sucker for Latin mottos. New York over Massachusetts - Tough one, as both have Latin mottos, but I like the simplicity of Excelsior more than Massachusetts' somewhat nonsensical one. Also, good classical figures are a bonus. DC over New Jersey - This was close; I don't love the DC design, and I like the classical figures on New Jersey, but boy is that a hideous shade of yellow. In the end, the fact that DC is based on Washington's coat of arms swung the day, but I do think it looks much better on a shield than on a flag. 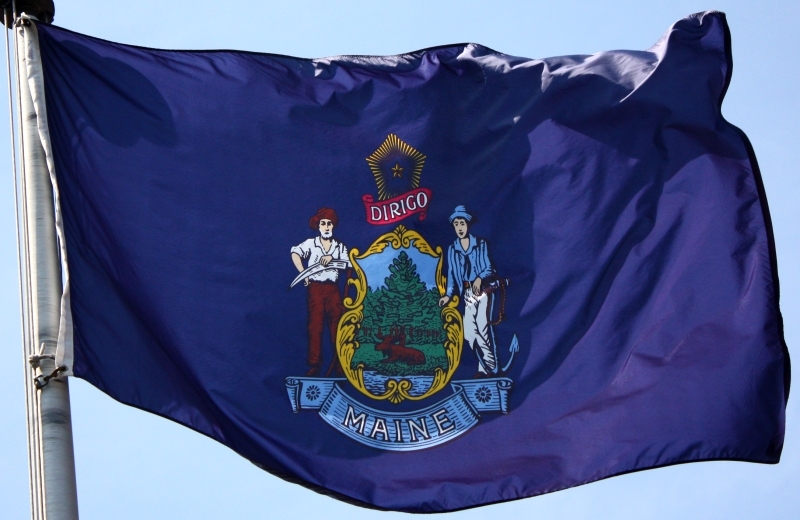 Virginia over Maine - Tough first round matchup for Maine, as Virginia's flag is quite simply awesome. Great motto, nice deep shade of blue, and Virtus trampling the tyrant. Connecticut over Pennsylvania - Latin motto, again, and I think the greater simplicity barely wins out here, though I do like the horses rampant. Dorkiest venture ever? Try awesomest. 1. Definitely New Hampshire. 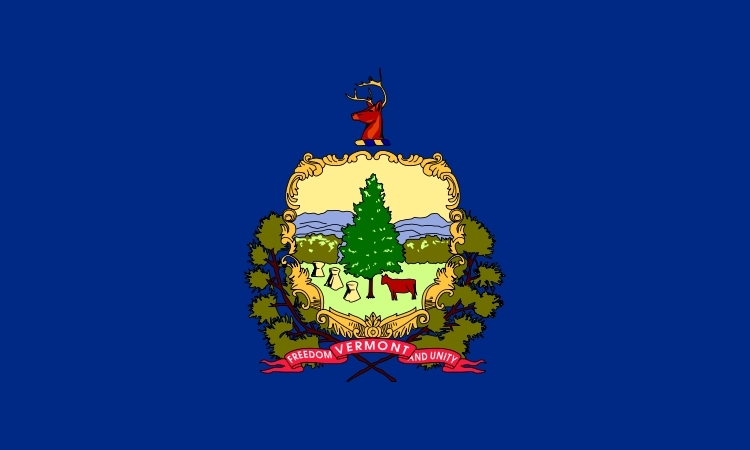 The Vermont flag looks like it was designed by a kid (not there's anything wrong with kids). 2. Both strange, but I'm more bothered by the West Virginians looking at eachother. I can feel the class-based awkwardness between them. 3. Wow, are all state flags weird? I'm on the fence on whether I kind of like New York's or not. I might be kind of digging its magestic self-importance (kind of like the city!). But it wouldn't matter. You don't destroy a group of people and then commemorate them on your flag. No dice MASS. 4. Shouldn't prosperty look a bit happier? Still, DC's seems a bit boring, and, clearly, I can't use too busy as a reason to dislike a US state flag. 5. I'll go with Virginia's giant erection over the surly hillbilly and recently washed ashore sailor. 6. Ooh, I kind of like both. Tough draw, these might be my two favorites thus far. But in the end, dark is always cooler than white- go Pennsylvania. That was fun, too bad it's over... Oh wait, there are still weeks to go. Rejoice! Ooh, Sorry ChuckDaddy -- your votes got stuck in the moderation bin, and didn't make it into the scores. But, I'm glad they are on record.